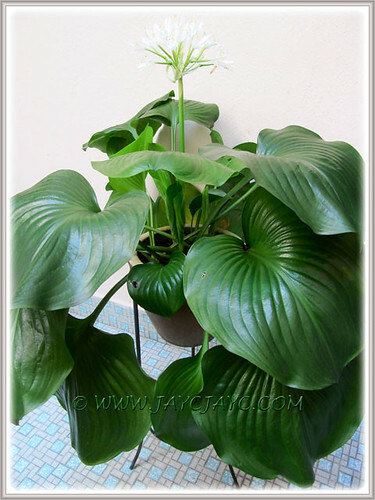 Yay… Cardwell Lily bloomed again during the Easter Season! How blessed to witness the gradual sprouting of the inflorescence of our Proiphys amboinensis (Cardwell Lily), starting from April 27th! Initially, we assumed that a new leaf was emerging, a little doubtful though as the petiole was strangely white instead of light green. Could it be a flowering spike? Praise God, our excitement was confirmed the next day when the tiny growth gained momentum and sprang forth to display its tiny cluster of flower buds. Simply marvelous! We weren’t at all surprised that the Cardwell Lilly chose to bloom again during the Easter Season. This is the third time that it rewarded us big time for our tender loving care, at two-year intervals. And, all three flowering occasions were during the Easter Season. Apparently, these plants love the Easter Season as much as we do, celebrating Jesus Christ’s resurrection with a bouquet of fabulous pure white flowers and giving us much joy! 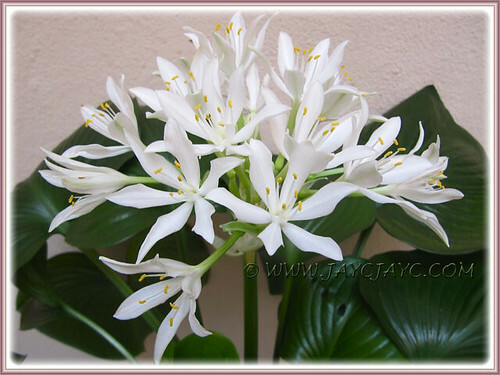 The rest is history as we marveled and enjoyed its blooming progress over the whole month of May. Appended below are some shots taken at intervals to capture its awesome beauty and eventual setting of glossy green seed pods. Enjoy!! 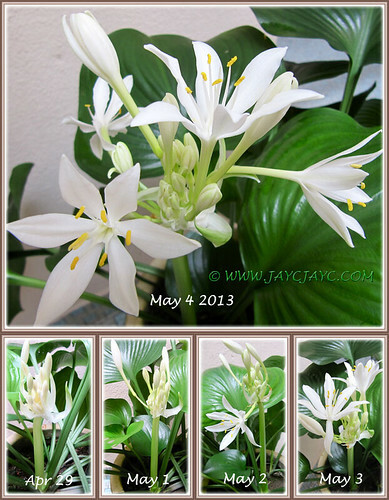 May 7, 2013 – The flower petals are absolutely pure white, untarnished! Sheer joy to look at them. Each flower generally has six petals, but occasionally there’s a freak seven-petaled flower as seen on the right. May 8, 2013 – Newly-opened flowers were added during the night for our viewing pleasure the next day. Hmm… such delight, I’m truly overjoyed and counting my blessings each day! May 10, 2013 – Wow… look at this magnificent display! Three-quarters of the buds are already in full bloom. This lovely flowering stem eventually had a cluster of twenty flowers altogether. 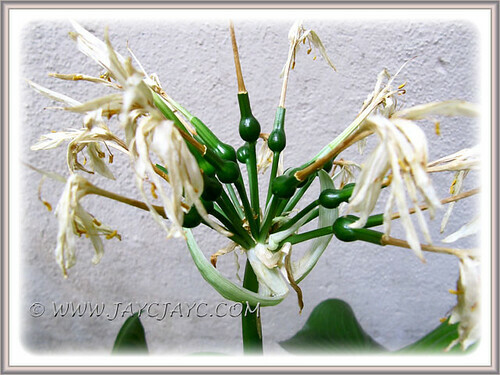 As the blooming process continues, the earlier opened flowers will gradually close up and start to set seed pods as seen in the last image below. May 28, 2013 – Spent flowers have already set the globular and glossy seed pods which can be used for propagating new plants when ripen. An article on how-to propagate by seed, here if you’re interested. Plant ID for Hosta look-alike? It’s Proiphys amboinensis! April 2011: Easter Joy in our tropical garden! Thank you, Bernie… it sure is! Happy gardening and have a lovely weekend. 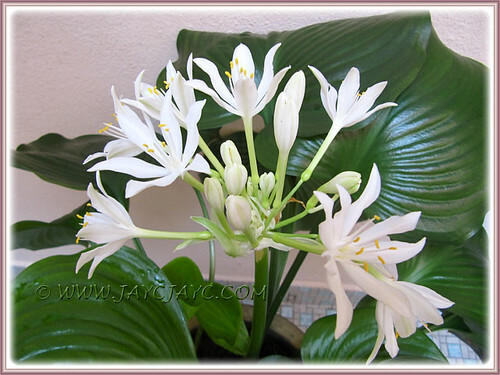 That bulbous beauty, its flower is exquisite, thanks for showing it. Truly a wonderful flower spike with many flowers. It must be wonderful to have this beautiful bloom during the Easter Season. I’m sure its heavenly sent also heavenly scented! I hope you are feeling much much better compared to before. All Glory & Praise to the Lord Jesus Christ! beautiful flower, thanks for showing. @ Yara – Our pleasure and joy in sharing. We want the whole wide world to be awed by its spectacular beauty. @ James – Indeed, we were extremely joyous with this complementary Easter blessing. 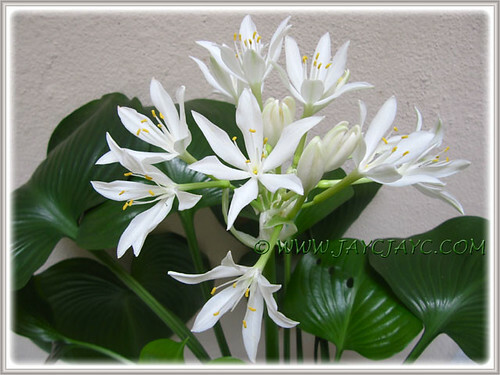 Flowers not scented but the pureness of the white flowers against the green foliage is simply remarkable! I’m truly touched by your concern re my health, James. Halleluia!! By God’s grace, love and mercy, I am healed… He was with me through it all! I’m my old self again, health-wise and am so happy to be gardening again with a vengeance. All glory, honour, praise and thanks to our Lord Jesus Christ!! TQVM, James… I really appreciate your kind thoughts.